Artwork details: pen and gold ink, 5 x 3 inches (13 x 8 cm), 1993. This card was actually a black photocopied design on coloured paper, with gold paint added to each card, and that was the first and last time I hand-coloured all the Christmas cards! 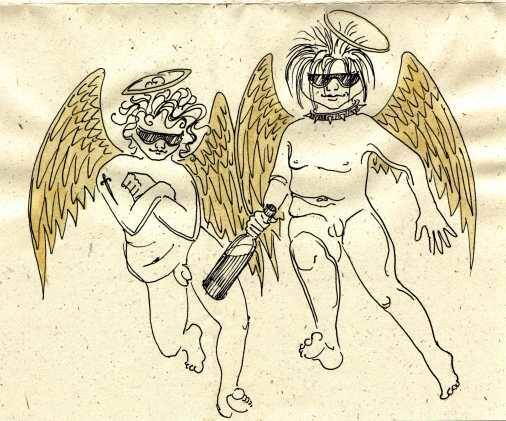 I made Tony a slightly different set of cards to use - his weren't hand coloured, but he did have a wicked female cherub, too, as an alternative design... Sadly I think this one has been lost in the mists of time and I cannot now find a single image of it. This drawing has the honour of being the oldest image on the site, unless I ever upload some stuff from when I was very young, and it dates to about 6 years before I started painting - back then I just did the once-a-year Christmas card, and this is the first one.